Meladerm Canada - How to Properly Identify Age Spots! Age spots are known to be quite common in middle aged and elderly individuals who have suffered from prolonged sun exposure over many years, or even decades. Also called liver spots or sun spots, these dark and brown spots that often appear on the face, arms, hands or even the feet and legs of an individual can be quite difficult to identify. Despite this fact, however, sun spots are mostly harmless, and the only reason why you might want to treat them has more to do with cosmetics rather than avoiding any kind of harm. 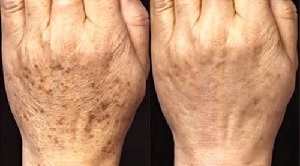 First of all, unlike other types of pigmentation issues, they typically appear in the case of fair skinned individuals. They can still appear in individuals with darker skin, but it’s considerably less prevalent. The color of these spots is tan, brown or black, and they can easily be defined due to their pronounced contrast and distinctive, oval shape. The main areas that are affected by age spots are those that have suffered from the most exposure to sunlight over the years. These can include your face, shoulders, arms or tops of your feet. Some would say that these spots are easy to identify, but this is not always the case. Also, without a proper diagnosis, you might realize that you’ve been trying to treat another, perhaps more serious disease, with medication and remedies for sun spots. As for their size, they can be quite small – the size of a freckle in some cases – and they can also reach slightly larger diameters of around ½ of an inch. Also, some types of sun spots can be found grouped together to cover a prominent, larger area. Usually, you have nothing to worry about when it comes to liver spots, and even though they may have been on your skin for years, their treatment can be fairly easy with the help of exfoliating agents, natural remedies and various other topically applied compounds such as Meladerm. However, you should consider visiting your doctor when the spots increase rapidly in size, have an irregular border, are painful or itchy, or if they are darkly pigmented. These could be signs of melanoma – a considerably serious type of skin cancer. Also, you don’t have to wait and hesitate before seeking help with your problem. Age spots are easy to treat, and there’s no reason why you can’t enjoy the appealing, shiny and silky skin you’ve always wanted.